Not for sale online in California. The T-BOX (SP200) is a permanently mounted system that is installed on a boat with access to a 12V power supply. 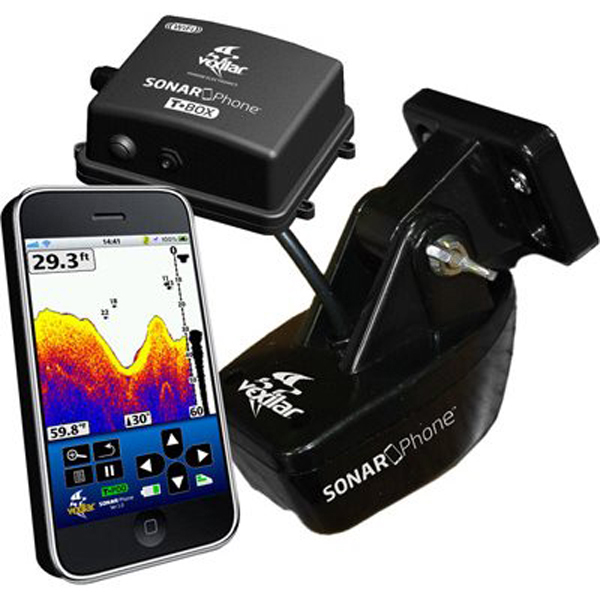 As the name implies, SonarPhone turns your smartphone or tablet into a fully functional sonar system that will rival any high-end sonar on the market today. It uses patented WiFi signal technology to transmit to smartphones or tablets. You don’t need cell phone coverage to use it, and the SonarPhone will work anywhere in the world. The SonarPhone creates its own WiFi hotspot, and you can share your signal with as many people as you wish. The software App is downloaded for free from the App Store and works with both Android and IOS systems. All SonarPhone T-BOXes come with a neoprene armband so you will have easy and safe access to your phone display at all times.